With the small business owner always in mind, Formilla Live Chat launches another must have feature: real-time visitor alerts! By enabling real-time visitor alerts, you can get notified whenever a customer arrives to your website by receiving sound alerts, desktop notifications right to your desktop web browser, or even push notifications to your iPhone, iPad, or Android smartphone or tablet. You’ll get insight into how visitors use your website with the real-time visitor monitoring dashboard as well, which is a lot like Google Analytics real time view, but with real-time alerts! 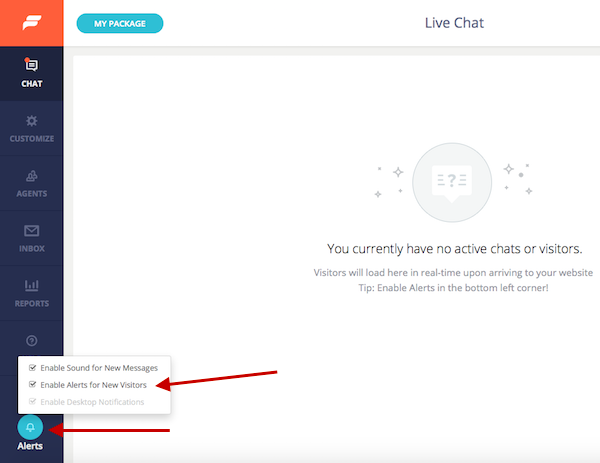 Use the power of live chat to request a chat with your users as soon as they arrive to your website, or enable automatic popups with our Smart Messages feature to do the heavy lifting for you. Don’t have a Formilla account? Sign up and try it out with our free 15-day Premium Plus trial to receive real-time visitor alerts today. Enabling desktop sound alerts when visitors arrive to your website: All account sign-ups are automatically enabled for real-time alerts when using the Formilla live chat web dashboard. 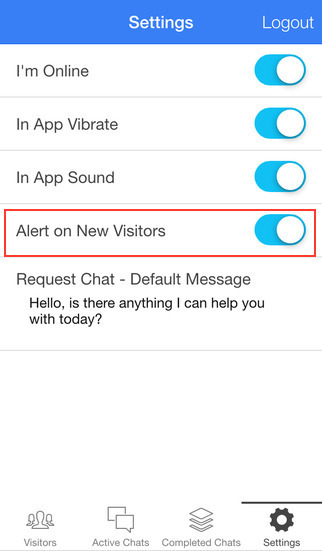 Visitor alerts can be configured from the green settings icon on your Formilla live chat dashboard as shown below. Simply check or uncheck the ‘Enable Alerts for New Visitors’ box accordingly. Once enabled, you’ll hear a doorbell sound every time a customer arrives to your website. If you’re using Google Chrome, Mozilla Firefox, or Apple’s Safari browser, you can also be alerted with desktop notifications through your internet browser right away if you’re busy doing something in another browser tab. This way, you’ll never miss a beat when you have a visitor on your website! Enabling mobile app push notifications when visitors arrive to your website: Download Formilla Live Chat mobile apps for your iPhone, iPad, or Android smartphone or tablet to get started. By default, real-time visitor alerts are not enabled when you install the mobile app. Simply login to the mobile app using your Formilla Live Chat account credentials and touch the settings tab within the app to enable the setting ‘Alert on New Visitors’. Note: you must have Push Notifications enabled for the Formilla Live Chat app to receive alerts as they will only arrive when the app is in the background or your phone is on the lock screen (standby). Having any trouble? Please Contact us if you have any questions as we’re always willing to help!